Did you want, or at the very least expect, more Darth Maul in the Star Wars prequel movies? Turns out, you're not alone. In fact, you're in really good company. 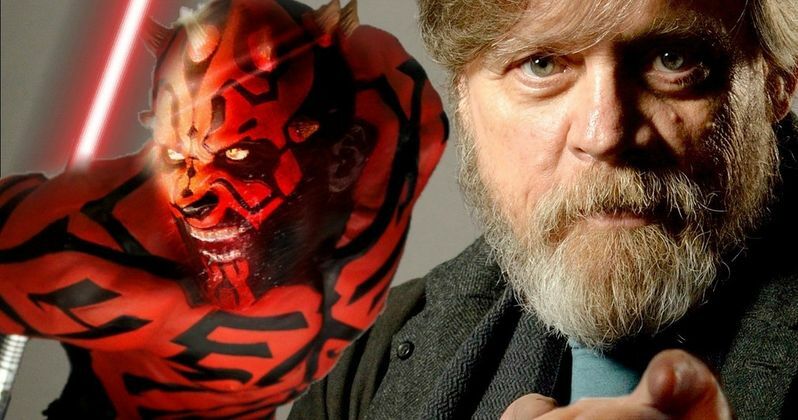 Luke Skywalker himself, Mark Hamill, also expected and wanted to see some more of the red-skinned Sith Lord from Star Wars: Episode I - The Phantom Menace. The actor recently spoke with Polygon at Disney's D23 Expo. Mark Hamill was there in support of Star Wars: The Last Jedi, which looks like it could be a great entry in a galaxy far, far away. While speaking about a not-so-good entry in the franchise, Hamill revealed that he was quite surprised that George Lucas decided to get rid of Darth Maul at the end of Star Wars: The Phantom Menace and that the character should have appeared in all three prequels. Here's what he had to say about it. "Darth Maul was just the coolest looking. I couldn't believe they disposed of him so quickly. I thought he would last through all three movies!" Mark Hamill speaks for us all on this one. Star Wars: The Phantom Menace did a lot of things wrong. Seriously, so many things. And even the things that it kind of did right, like Darth Maul, it kind of did wrong. Easily the coolest thing from Episode I was disposed of before the movies really had a chance to explore Darth Maul. Though, he didn't actually die, even if Star Wars: Attack of the Clones and Star Wars: Revenge of the Sith didn't make use of that fact. The character was revived in the Star Wars: The Clone Wars animated series and later brought back in Star Wars Rebels. Darth Maul remains a fan-favorite Star Wars character nearly 20 years later. A deadly, agile Sith Lord trained by the evil Darth Sidious, Darth Maul was a formidable warrior and scheming mastermind. His awesome and intimidating double-bladed lightsaber is still one of the coolest and most deadly we have ever seen on screen. Though he was cut in half and fell an unfathomable distance in his battle against Obi-Wan Kenobi, after Qui-Gon Jinn was killed, the Sith was resurrected with a pair of metal legs and went on to survive in the Star Wars canon for many years. Marvel Comics currently has a Darth Maul series running, for those who are still looking for a little more double-bladed lightsaber action. Or, if you haven't watched Star Wars Rebels yet, that is a good place to look. Maybe one of the new enemies in Star Wars: The Last Jedi will have one? We would be so lucky. At least it's cool to know that Mark Hamill, as a Star Wars fan and not as one of the key figures of the franchise, feels the same way many of us do. Never change, Mark.